New Punic Generals, who change appearance based on age, rank and season. This will be the fourth release in a series of campaign agent character mods with the aim of providing players with characters that dynamically replace their appearances with alternating variants based on three attributes for all campaigns. Ideas + Discussion: In the past I've just worked quietly on the mods, mostly doing my own research for how the characters should generally look like, working on a whole load of stuff and then surprising people with an update. This time I want to hear your ideas for what they should look like first. Feel free to share and discuss anything in relation to how these Punic characters should look (historical references - images, texts etc). Don't worry if the assets don't exist in the game, I have the ability to make them myself (helmets, torso armour, tunics, greaves, weapons, shields, cloaks, jewellery etc). Research: Opening this discussion early (hopefully) gives me the research + references I need faster, since I presume a lot of people on this part of TWC are history buffs and might know more than I do in regards to what Punic leaders or nobles may have worn. Future: Lastly, I wanted to let you all know which AAA mod will come next - a lot of people keep asking what the next mod I'm going to work on will be, so here's the answer. Last edited by Benjin; March 20, 2019 at 12:41 PM. 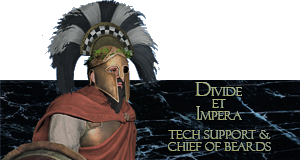 Regarding Caesar, short answer is yes you need Dresden's historical family submod in order to see Caesar - with his appearance from the “Caesar in Gaul” campaign - spawn in the Grand Campaign. Long answer is that, in the vanilla game, there are historical characters who spawn as recruitable candidates for your faction (and, I believe, for the AI as well). However, there’s an obscure bug with their appearances - they are assigned generic random appearances instead of the ones they are supposed to be given in the database files. They only appear correctly if they are spawned via a payload (i.e. an award from an event or dilemma), which is what Dresden’s mod does (his mod only works for your faction and party though). This is why people sometimes see a “Gaius Julius Caesar” character appear on the campaign map around 100BC for Rome, but without his unique appearance he is hard to spot. Wil you play the game? the game of thrones. I can't give a definite answer, sorry. It will be updated with the new Spartan stuff whenever I can dedicate time to work on it. Last edited by Benjin; March 19, 2019 at 08:47 PM. I'm looking forward ..... Thumbs up !!! Yeah, I was already thinking of doing this for Hannibal - would add a bit more character for him.